How Big Is a Starfish at Birth? Walking across the ocean floor on hydraulically powered tube feet, the lifestyles and life cycles of starfish are incredibly alien to humans. Represented by approximately 15,000 species, few generalities exist for the extremely diverse group. Most species have complex life cycles, and they can reproduce both sexually and asexually. 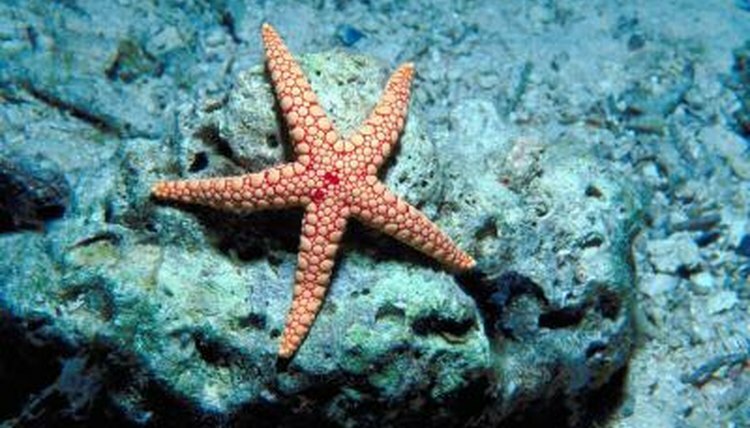 Asexual reproduction occurs when starfish detach an arm, or split in two. During sexual reproduction, adults release sperm and eggs into the water. When the two meet, they become fertilized zygotes. Most species hatch and become free-swimming larvae when the zygote enters the blastula stage -- one of the initial steps in cell cleavage. Blastula-stage starfish are usually about the size of a pinhead when they are “born,” although “hatch” is a more accurate term. In a matter of days or weeks the larvae develop bilateral symmetry -- a developmental period termed the bipinnaria stage. As an example, larvae of the species Asterias rubens are about 1/16 of an inch in length by the time they reach the bipinnaria stage. How Do Brittle Starfish Reproduce? Do Pill Bugs Have Eyes?